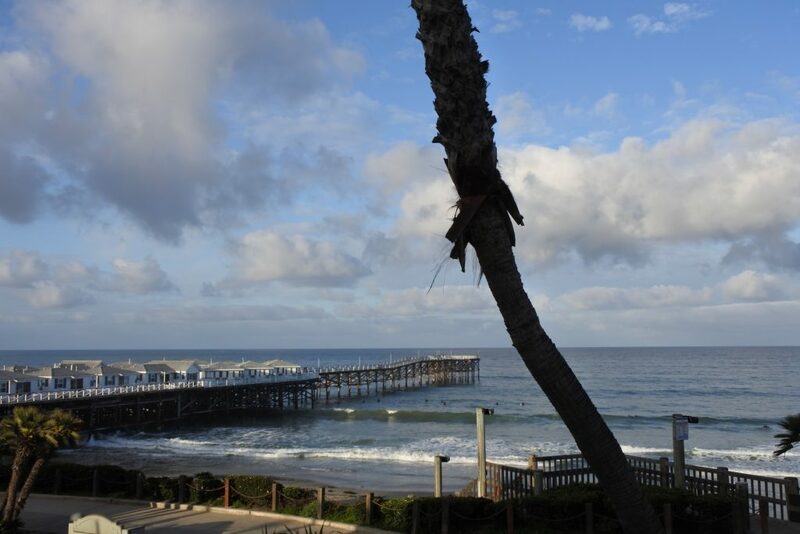 When planning a visit to San Diego there are many hotels and neighborhoods to choose from. We had never stayed anywhere on the beach, so having an ocean view room was number one on my wish list. 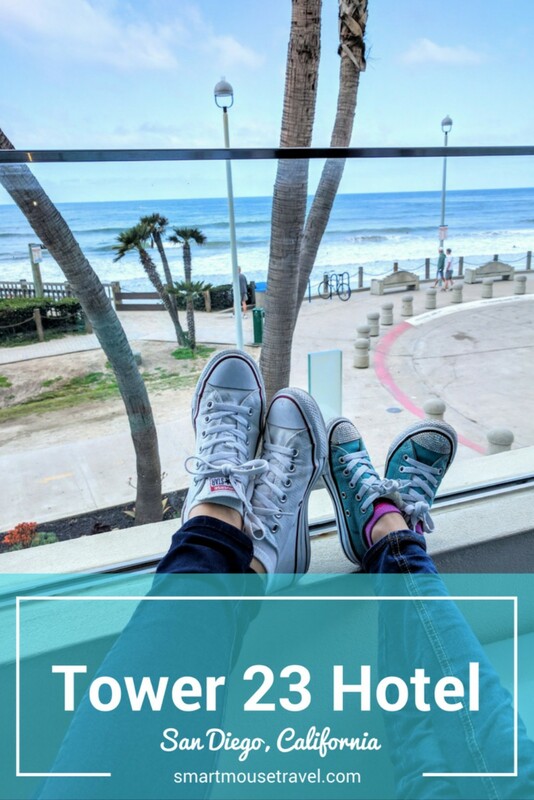 Our search for an affordable ocean view room is what led us to stay at Tower 23 in March 2017 and then brought us back again for a longer stay in March 2018. 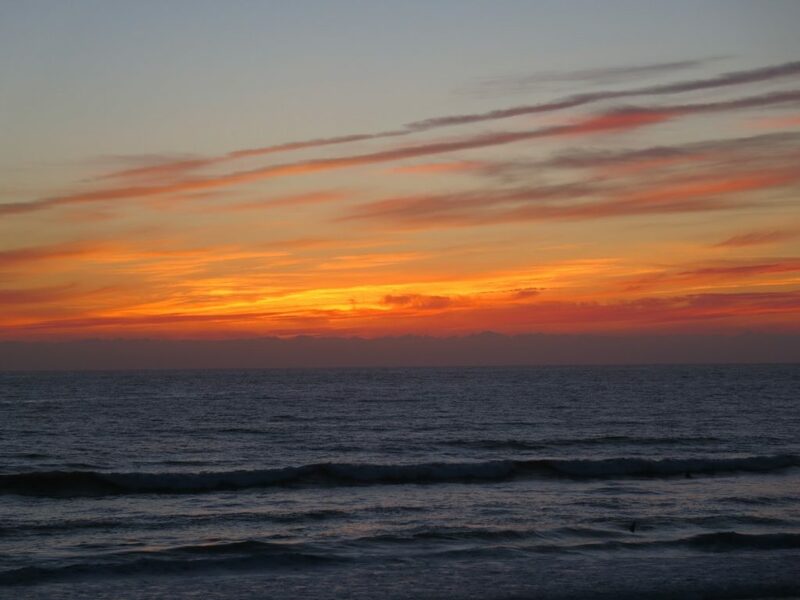 Located in Pacific Beach (a few miles north of downtown San Diego) Tower 23 is literally steps away from the beach. 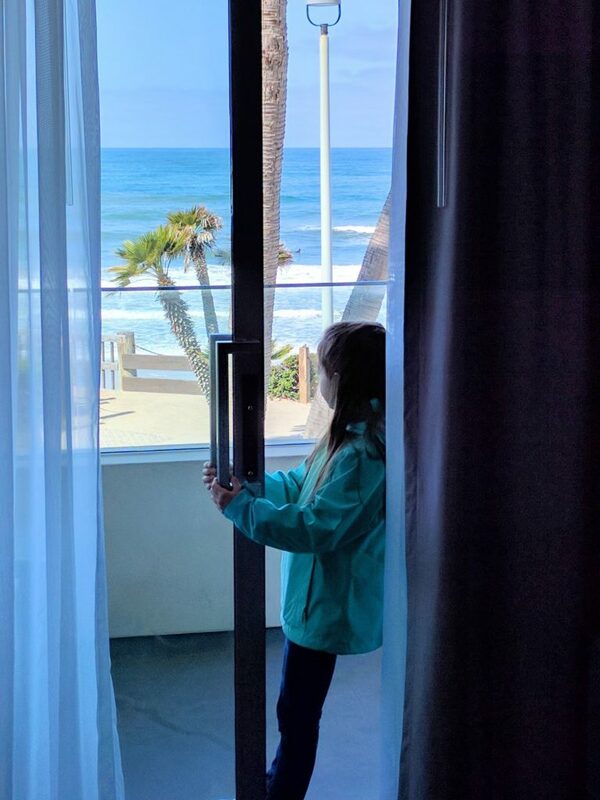 We opted for a more expensive room in the Oceanfront Queen/Queen, but the unobstructed view to the ocean and beach was completely worth the upgrade. The Pacific Beach neighborhood changed a lot in the past year. When we visited in 2017 the area was predominately young people and surfers, but on our most recent trip the area had definitely taken on a more family friendly vibe. Tower 23 is about a 20-minute drive to some of San Diego’s common tourist spots (like the U.S.S. Midway or San Diego Zoo). Find out more about our favorite San Diego family activities. Tower 23 is a small, luxury boutique hotel. There are several room types available for your stay with full or partial ocean view being the largest difference in room type. 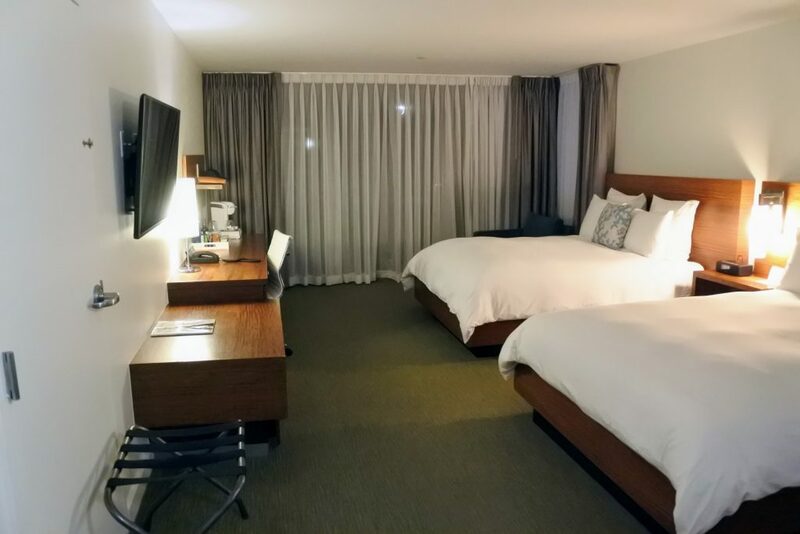 The hotel has limited amenities on-site except for their signature restaurant JRDN, but there are tons of coffee shops, restaurants, and even a CVS within a short walk of the hotel. If you don’t feel like taking a walk there is also a fully stocked mini-bar and snack station in your room. One of my favorite perks of staying at Tower 23 is the ability to borrow beach equipment. Tower 23 will loan towels, beach chairs, boogie boards, footballs, soccer balls, sand toys, and even beach umbrellas to hotel guests. This option to borrow beach gear saves a lot of wasted suitcase space and each day we had something new to play with on the beach. We borrowed equipment and spent several hours out by the water despite the chilly temperatures during our stay. In warmer weather I doubt we would ever leave the beach! Tower 23 also allows you to borrow bicycles. There are full size bicycles and they have also recently added a couple of big kid bikes to accommodate families with older kids. The Oceanfront queen/queen room was amazingly spacious. I had expected cramped quarters to be able to afford the perfect beach view, but was pleasantly surprised the room had plenty of space. The ocean view balcony gave even more livable area (not to mention breathtaking views) during our stays. 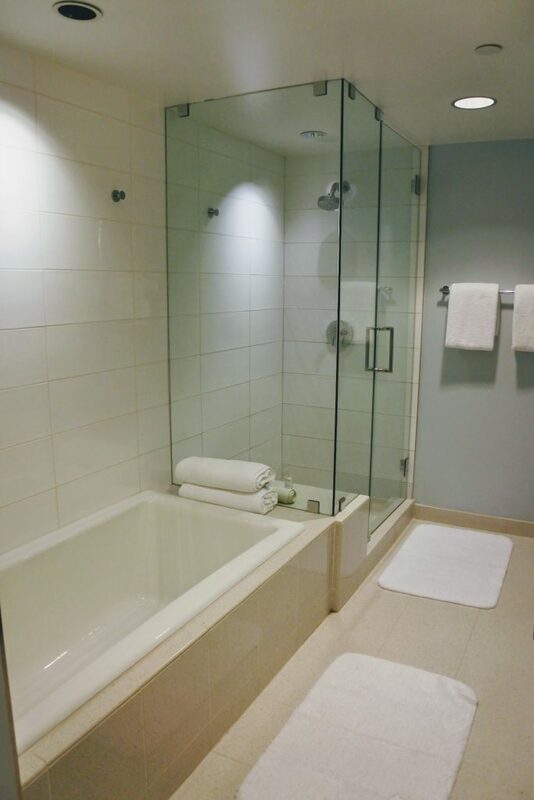 The bathroom at Tower 23 is quite large with both a bathtub and separate shower. A sliding barn door with an opaque glass panel provides decent privacy for the bathroom area. 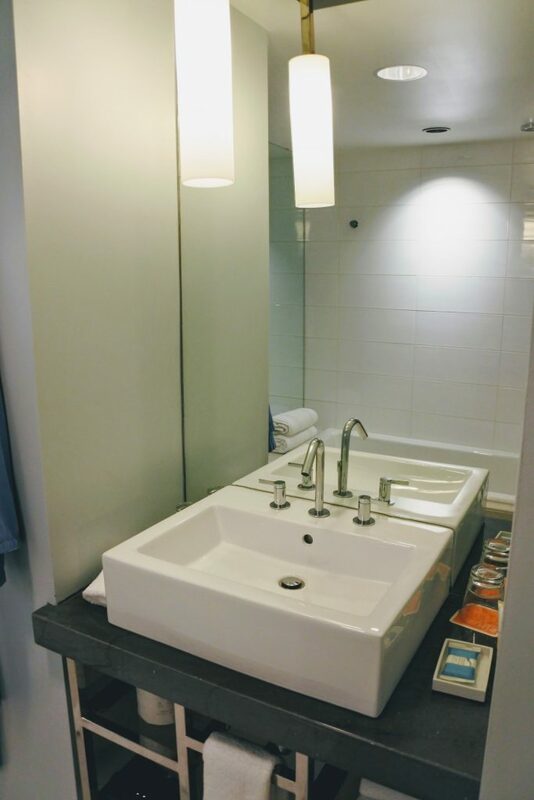 There is limited counter space by the sink itself, but after our last trip I learned to use the shelves under the sink to hold our toiletries. I would place my make-up bag on the counter when I got ready and then place it back on the shelf when I was done. Utilizing the shelves under the sink made the limited counter space easy to manage. The best part of our room was not even in the room. Our private balcony overlooking the ocean was amazing. I really mean it. First thing in the morning we would open the doors and listen to the waves as we got ready. And anytime we were in the room the sliding door was open to let the great ocean smell and sounds into our room. At night my husband and I would relax on the balcony with a glass of wine or cocktail from JRDN while Elizabeth was sleeping. The only parking option was valet at a cost of $35 per day when we were there. For that price you have unlimited in and out privilege during your stay. 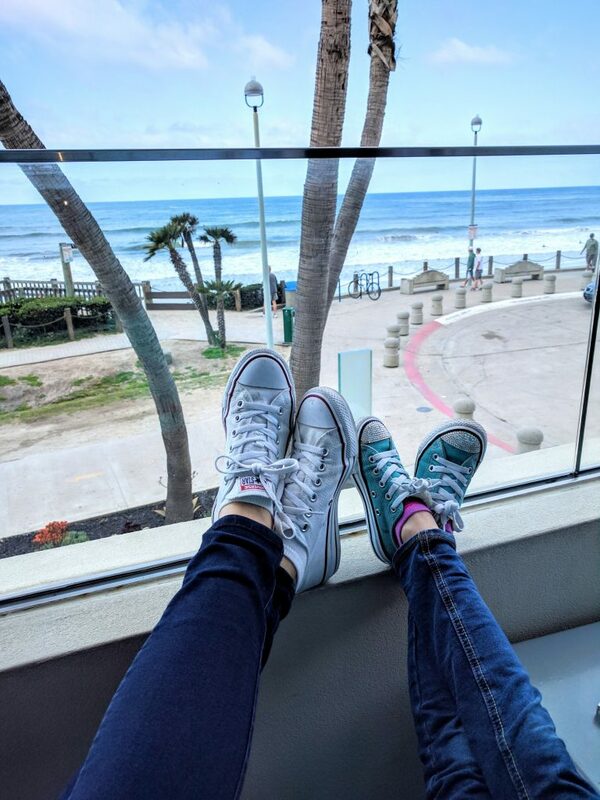 If you are searching to immerse yourself in the Southern California beach vibe then there is no better place than Tower 23 in Pacific Beach San Diego. All day you can see surfers out on the ocean, the beach is steps from the hotel, and there is no ignoring the casual California atmosphere that seems to permeate the entire area. Our whole family still talks about our time at Tower 23 nearly every day. Despite trying, I can’t fully explain the great experience we had during our visits and the magic of the view. This hotel and neighborhood has a relaxed surf vibe which gave me a great reminder to slow down. We absolutely loved both Ocean View Queen/Queen rooms we’ve had at Tower 23 (although we did like the one away from JRDN even better). Some online reviews claimed that Tower 23 was not family friendly, but I disagree. Although they aren’t necessarily courting the family traveler we saw several other families at Tower 23 on our last visit. 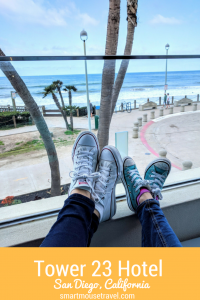 The staff is friendly, the rooms are large, the option to borrow beach gear and cheap eats nearby (by California standards) make it a great choice for our family. To sit on the balcony and hear the waves was incredible. In fact, we barely made checkout on time in March 2017 because I couldn’t tear myself away from the balcony to get on the road to the Flower Fields, San Juan Capistrano, and ultimately Anaheim. On the more recent trip I may have cried a little when we closed the sliding door for the last time before our flight back to Chicago (true story). 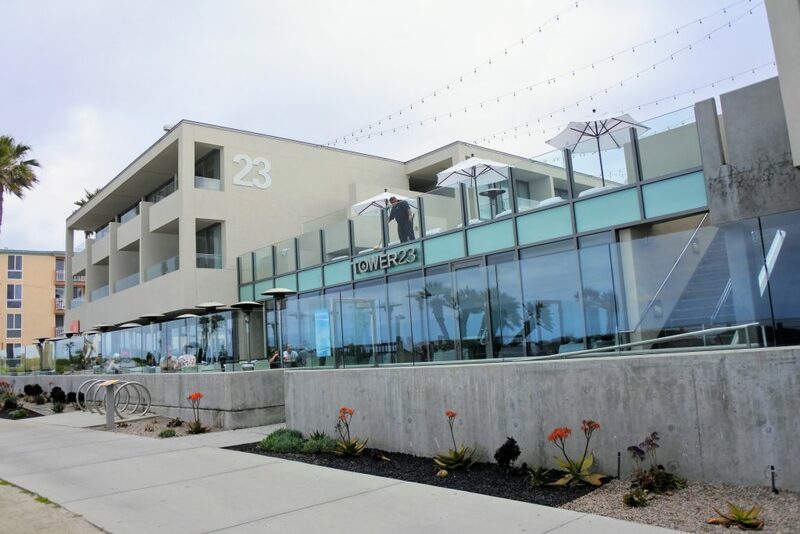 Have you stayed at Tower 23 in Pacific Beach San Diego? What did you think? I’m heading to Cali this summer will def keep this in mind! I think the bathrooom looks nice! Based on your personal review, I think this is a good place for my family to stay, if ever head over to San Diego. Thanks for sharing this and I certainly love their room too!